David Ignatius is to The Washington Post what Thomas Friedman is to The New York Times, the 50-yard line of the world as seen by political elites. Like Friedman (but minus the Mustachioed One’s tortured syntax and penchant for airport-to-Four-Seasons taxicab policy briefings), Ignatius mirrors the views of our wealthy, powerful and oblivious leaders at any given hour of the day. Like the president and his advisors and Congress and the Pentagon brass, he never spies a crisis abroad that couldn’t be improved by firing explosives at it. Long after everyone, including even the media, tires of the carnage (in Iraq, in Afghanistan, etc. ), he continues to defend it until the war’s approval ratings dip into fractions of a percentage point, at which point he pivots, bravely arguing that intervention is a mistake. At this writing, we are at the start of America’s war cycle: (post-beheading video) anger, bombing, more bombing, withdrawal. Obama’s bombing campaign against ISIS (the Islamic State of Iraq and Syria) in Syria is in its larval form. Which means Ignatius is cheerleading what the U.S. does best: turning living human beings into corpses. Ignatius approvingly cites fellow Iraq War neo-con Stephen Hadley (last seen in the desert searching for Saddam’s WMDs, rather than in prison where he belongs): “Hadley noted that Obama’s stance as a reluctant warrior will help him reassure foreigners and Americans alike that this isn’t a reckless, unilatateral U.S. crusade,” Ignatius writes. Beware of warmongers bearing the “no choice” argument. In matters of war, especially against a foe like ISIS deemed by U.S. government’s own professional intelligence analysts to pose no imminent threat to the U.S., there is always a choice. You might also want to be wary of warmongers whose last war, and the one before, and the one before that, didn’t work out well — guys who are always, reliably wrong. Though, to be fair to Iggy, that’s also true about most of his colleagues. More galling than Ignatius’ Lucy-and-the-football “no, really, this time really will be awesome” here-we-go-again shtick is this “mainstream” columnist’s belief that Americans can’t remember the last five years of U.S. history. When it comes to killing, Obama is anything but reluctant. To the contrary — he makes George W. Bush look like a dirty peace hippie. Barack Obama won the presidency in 2008 by running against the “stupid war” against Iraq. Once in office, however, he issued order after order extending said stupid war with tens of thousands of soldiers and U.S. private “contractors” (corporate mercenaries). Obama doubled down in Afghanistan with the failed “surge” of additional troops. It’s pretty much forgotten now, but in 2011 Obama went in deep against Libya, assassinating dictator Col. Moammar Gaddaffi with a drone. The collapse of Gaddaffi’s government opened a vacuum instantly filled by Benghazi-based radical Islamist militias and sparked a civil war that has reduced a formerly viable nation to a failed state. 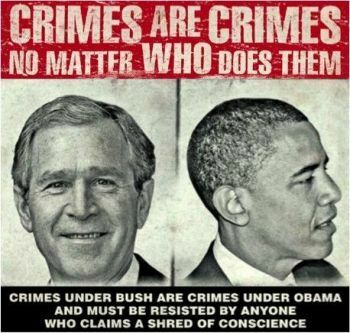 Does anyone need reminding that Obama aggressively expanded Bush’s illegal program of drone assassinations in Yemen, east Africa and Pakistan, killing thousands of people, 98% or so of whom have been innocent civilians? Or that, rather than grant the victims of the 9/11 attacks justice in the form of a trial, he ordered the assassination and midnight body dump of Osama bin Laden? From Iraq to Afghanistan to Libya to now Iraq all over again, Barack Obama is as much of a “reluctant warrior” as Genghis Khan. This entry was posted in Blog, Columns and tagged Assassinations, columnists, David Ignatius, drones, George W. Bush, Iraq, ISIS, Libya, Obama, Osama bin Laden, pundits, Syria, Thomas friedman, warmongers on September 24, 2014 by Ted Rall.